Carly Fearon from Burghead Primary, Veronica Nicol from Botriphnie Primary, RAF Lossiemouth's chief technician Heidi Blakely, and Flight Lieutenant Fiona Padbury. Education kits to encourage youngsters to consider careers in engineering and the sciences have been handed out in Moray schools. The RAF has teamed up with the Royal Academy of Engineering to put together the resource as part of the air force’s centenary. The packs contain challenges designed to stretch the imagination of primary school pupils with tasks surrounding aircraft design, disaster relief and code-breaking. Janey Irving, Moray Council’s primary science development officer, believes the tasks will broaden the horizons for students. She said: “The RAF has had a long history in Moray contributing to our landscape and culture and this resource puts Stem (science, technology, engineering and maths) learning into a local context. 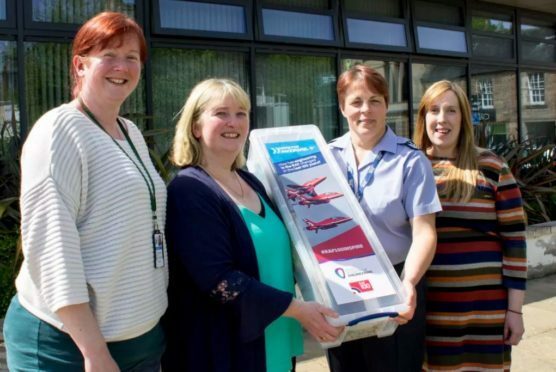 “Encouraging this kind of learning in our schools has been a key focus of the partnership with RAF Lossiemouth and the council – which has led to the development of a ‘Stem in the workplace’ event for P6 pupils and secondary school activities. The packs have been funded by fines issued to banks as part of the Libor scandal, which involved bankers colluding to fix interest rates. The UK Government allocated cash raised to the Ministry of Defence to support armed forces communities.